Shauna Lewis in Culture & Arts Drama Editor's Picks on 6 May, 2018. So often with theatre revolving around sensitive topics it can become purely an advert for awareness, the viewers end up forgetting the narrative and become force-fed the message about the need for change. There’s nothing wrong with this, it can often be highly effective. As the discussion afterwards puts it though, ‘It’s not issue-based drama, it’s drama presenting issues.’ Theatre doesn’t have to solely focus around its political or social discourse for the audience to grasp what they are trying to say. Waiting for Gandalf demonstrates this through the integration of plot and characterisation, alongside clearly and eloquently portraying the consequences of being sexually abused as an adolescent. Waiting for Godot open’s with superfan Chris Neville-Smith’s character running to get his place to be first in line for “Gandalf” to sign his copy of The Two Towers. After questioning the audience about their own enthusiasm, Smith settles down with his newly-found “friends” to discuss his love for Lord of the Rings and what makes it so special for him. Initially bringing up his inspirational teacher Mr Turner, his problematic family life and struggle with relationships, the piece gradually releases a repressed anger from Smith and shows, although he can escape momentarily into a fantasy universe, ultimately, he cannot escape from his own life and memories. One of the many elements which makes the play so hard-hitting, is the easily identifiable character Smith plays. We all had a group of boys at school who didn’t really seem interested in anything but pop culture such as Lord of the Rings, Star Wars, Star Trek and video games like Skyrim. There was an earnestness about their enthusiasm though, which was so endearing, and Smith manages to capture this in performance immediately and gives the play the ease of a conversation with someone you know. He perfectly suited the role, as an audience member you were so comfortable with his presence. Then, as he began to descend from his comical role to reveal the repressed trauma underneath, you felt as if you were with him, hearing the story from a stranger who you’d only met an hour previously. A testament to the acting also is the setting of the show, the audience were seated upon the stage of the Assembly Rooms Theatre and it made for an incredibly intimate environment in which you could see the unravelling of Smith’s character up close. Yet, there was no awkward feeling when he looked you in the eye, for his role was so well-inhabited. As Smith mentioned afterwards, he had drawn upon personal experience for his character, and it truly showed as he gave a thoroughly nuanced performance, which didn’t seem overtly exaggerated for the sake of conveying the impact of his past trauma, but realistic and raw. The idea to convey Smith’s character’s escapism through Lord of the Rings was an ingenious idea on the behalf of the writer Adrian Marks. Utilising direct lines from the books and films, the journey of Frodo & Co reverberates throughout the story, offering us the appeal of its escapism as well as demonstrating the burden placed on Smith’s character through the use and references to the ring. Simultaneously the writing and directing (Patrick Sandford) carefully treads the revelation of the abuser, forcing the audience to wonder who it is and only in the last quarter of the play does it become clear. It is so apparent throughout how sensitive the production team were to the nature of the issues being addressed, and it simply could not have been produced by anyone who hadn’t experienced similar traumas. The Q&A after the performance explored this further, demonstrating the team’s dedication to raising awareness of sexual abuse experience by men and the lack of attention surrounding the issue itself. They drew attention to issues of abuse by female perpetrators, something which they wish to explore further in the future, and the lack of funding by the government to tackle sexual abuse, comparing its lack of advertising to the unavoidable adverts against the AIDS crisis. Although the message of the play could be perceived as pessimistic, the ending and the discussion afterwards provided a note of much-needed optimism. Director Patrick Sandford looked at the figure of Gandalf as one of hope throughout the play, remarking that many people eventually encounter the person they can look to for guidance, or can even find it within themselves. Although Waiting for Gandalf perhaps found this person in its titular figure, Mankind as a charity and the play itself could perhaps be that hope for some people, and in its run, will hopefully start to raise awareness and bring about discussion on the sadly neglected issue of sexual abuse against men. 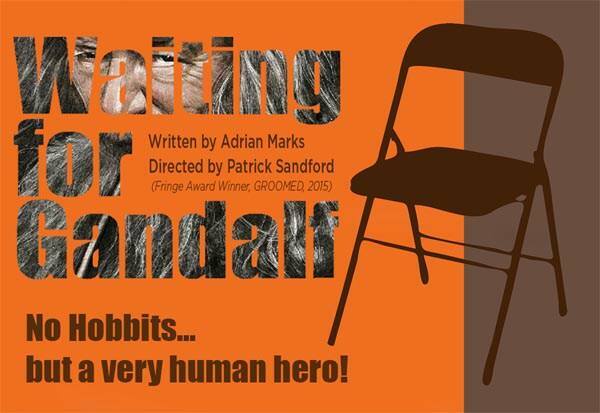 Waiting for Gandalf will be on at the Brighton Fringe from 14th- 20th May.